Note that this table has a certain hierarchy of employees and managers, such that a certain employee may also be a manager. For example, employee number 7 (Merlin Evans) is also the manager of Elroy Wilson, Charles Thomas, and Rudolph Roberts. 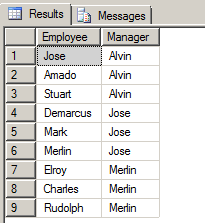 First Task – Create a query to display the name of all employees, and the name of their manager. 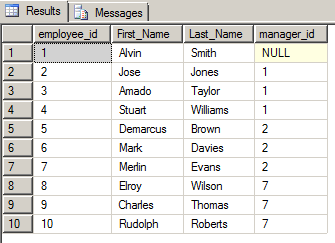 Second Task – Create a query to display the hierarchical relationship between a certain employee and his direct and indirect managers.